When Will Bernie Sanders Drop Out of the 2016 Presidential Race? 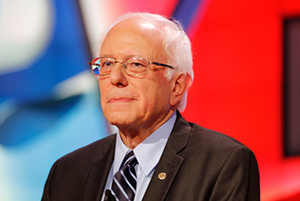 Subject: When Will Bernie Sanders Drop Out of the 2016 Presidential Race? After a disappointing string of primary losses on June 7, Bernie Sanders has defiantly pledged to stay in the race against presumptive Democratic nominee Hillary Clinton. Now, many Democrats, Republicans, and independents alike are wondering just how long Bernie Sanders is willing to fight. Clinton swept four of six states on Tuesday, including California, which has the biggest delegate haul. Sanders won North Dakota and Montana. Clinton now has 2,755 delegates to Sanders' 1,852. The required delegates needed to become the Democratic nominee is 2,383. Despite many Clinton supporters and high-profile Democrats urging his surrender, Sanders said in front of his supporters Tuesday night that he'll continue to "fight hard" at least until the final primary in Washington, D.C., on June 14. Many believe that Bernie Sanders will stay in the race until the Democratic National Convention in Philadelphia on July 27-28. At this point, the only strategy Sanders can use to clinch the Democratic nomination away from Clinton is to sway her superdelegates. These are Democratic Party insiders that are free to vote for either Clinton or Sanders at the DNC. There are 619 superdelegates in the 2016 presidential election, and Clinton currently has the support of 571. Sanders will need to grab at least 531 of Clinton's superdelegate supporters if he hopes to reach the magic 2,383 number. At best, winning the final primary in D.C. could reduce that must-have number to 485. Many Sanders supporters believe the hundreds of superdelegates that backed Clinton early on have a duty to consider voting for Sanders. They see the system as rigged against a party outsider like Sanders. Even before Tuesday's primaries, major news outlets were calling the Democratic race for Clinton because of her superdelegate support. Sanders' strategy is a long shot for sure, but it's the only route to the Democratic nomination he has left. The last contested Democratic convention was the 1980 presidential race between Jimmy Carter and Ted Kennedy. Kennedy put up a strong effort, but ultimately failed to secure Carter's superdelegates. Because, unlike Hillary and Trump he will keep his promise to America- that he will go until all votes are cast, which means he'll take it to the convention. Because unlike Hillary and Trump, he actually tends to tell the truth. No doubt Hillary paid good money to the media-and likely Money Morning- to print nothing good and everything bad about Bernie, if anything at all, while giving her lots of good press despite she broke the rules when it comes to securing top secret information and much less why she collects tons of money just to talk to banks, the odd things going on with the Clinton Foundation and her ties to Wall Street, etc. the list goes on. It's Bernie's RIGHT to march on until the very end. That is part of the Democratic election process. To suggest otherwise is, in fact, far more communist than anyone even would seem to think that Democratic Socialism might be. You guys are morons. If I were you I'd shut up and let this play out.